at the Kingstown Cemetery in Rose Place. 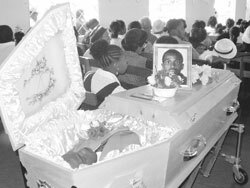 After a well attended funeral service at the Kingstown Baptist Church, Wynneâs body was driven through Block 2000 where he grew up and had lived up until his death. On arrival at Rose Place, friends of the deceased removed the coffin from the hearse and carried it to its final resting place, where they themselves took up the task of burying Wynne amidst singing and crying.